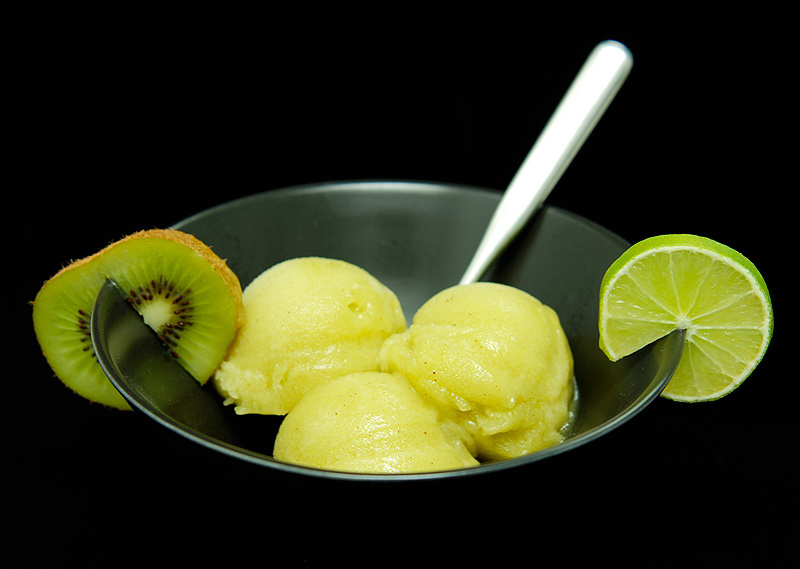 I’ve always wanted to make a sorbet with a delicate fruit like kiwifruit. Fruits with subtle flavors usually aren’t appropriate for soloing in sorbets, so I thought pairing kiwis with limes might be a nice idea (apparently others do, too). Lime by itself would probably be too tart, so this seemed like a good way to make a lime flavored sorbet. 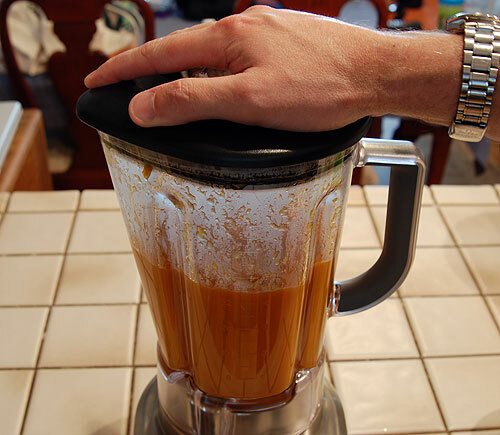 I opted to combine flavor extracted from lime rind with some of the fresh juice so I could get plenty of lime flavor and a little fresh zing from the juice. 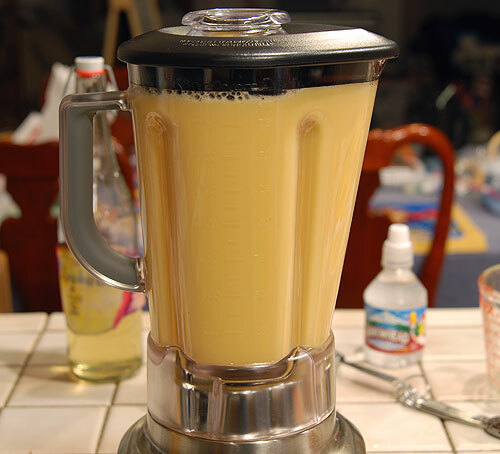 Finally, a little limoncello added to the mix and the resulting texture was wonderful without any hint of iciness. At first I thought the lime flavor was a little strong, but it mellowed out after a few days. 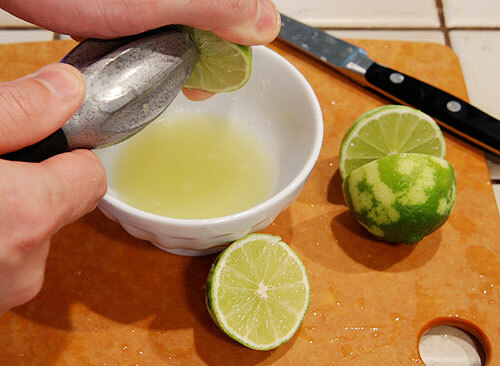 The kiwi flavor is subtle, and the lime does a good job at keeping things interesting. 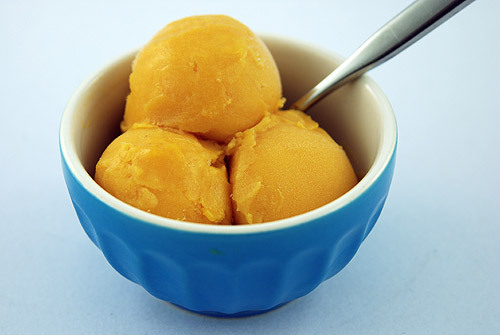 This sorbet recipe is fresh, unique, and goes well with spicy foods. 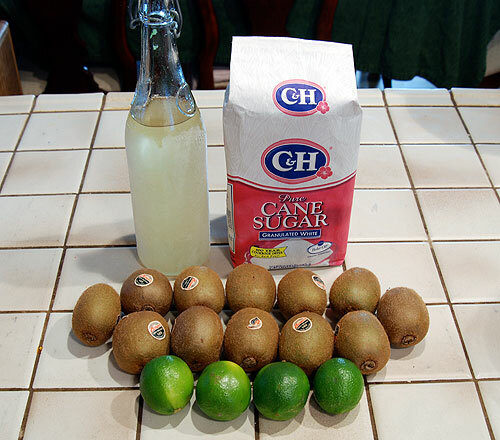 Ingredients for making Kiwi Lime Sorbet. 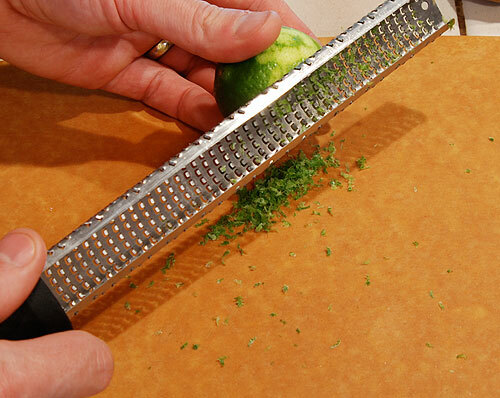 Grate the rind from about 4 limes to yield about a tablespoon of zest. 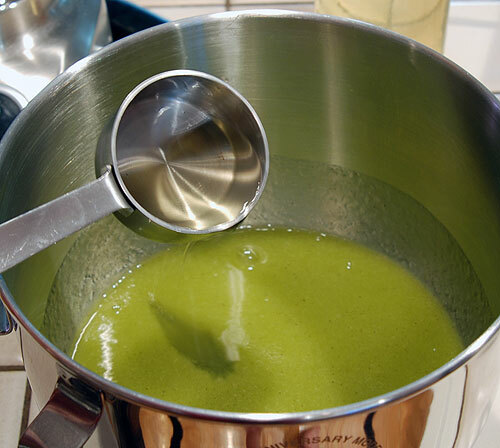 Gently boil 3/4 cups of sugar in 1/2 cup of water with the lime zest for about 10 minutes. Peel about 10 to 12 kiwis, removing white core if desired. Juice 2 of the limes. 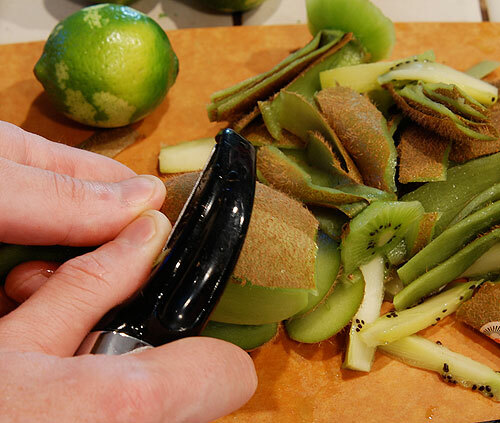 A little juice goes a long way with the mild kiwis. 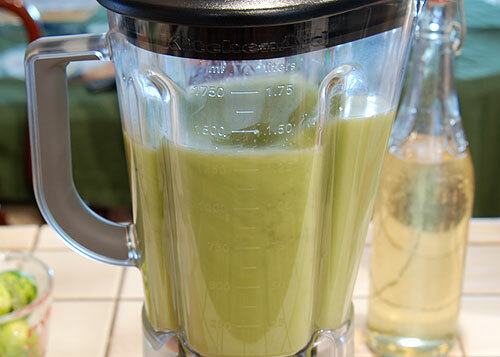 Pour the juice into blender with peeled kiwis and reduced sugar/zest water. Purée mixture just until smooth. 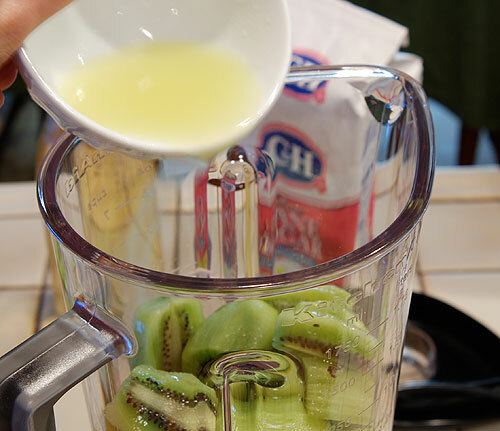 The delicate kiwi seeds will start to break down if you over blend. 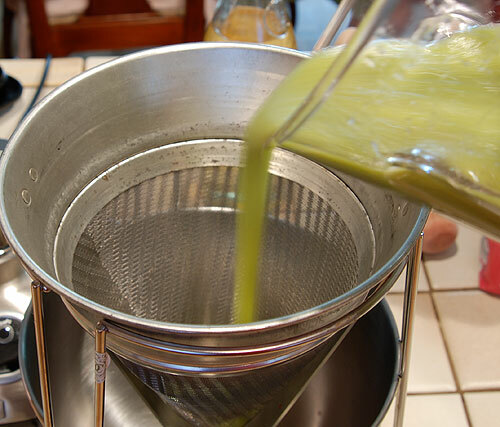 Use a chinois or sieve to remove the seeds from the kiwi purée. 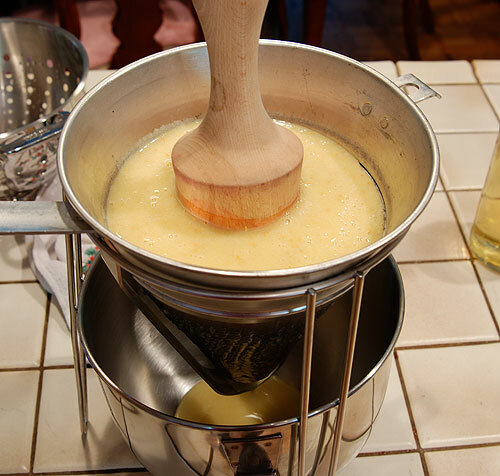 Add 1/4 cup of Limoncello to the sorbet base and stir until blended. 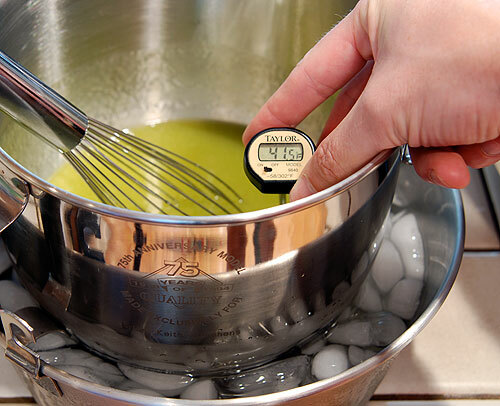 Chill sorbet base in an ice bath until less than 45° F.
Pour chilled base into ice cream maker and freeze according to your ice cream maker’s instructions. Transfer finished sorbet to an odor-free container to ripen in the freezer for several hours. 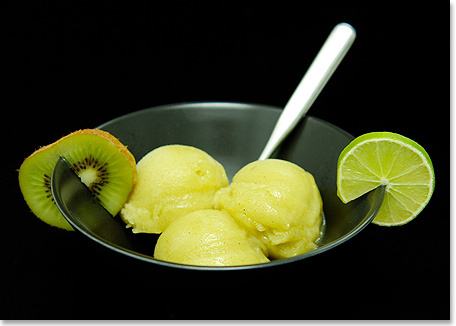 The recipe pictured above, with detailed instructions and photo gallery can be found on the Kiwi Lime Sorbet recipe page. This recipe was given to me by a high school classmate with whom I recently got in touch with at our 20 year reunion. After he found out I had a food blog, he mentioned a family recipe for cranberry frappe that he would share if I was interested. He said they usually serve this instead of cranberry sauce at Thanksgiving. 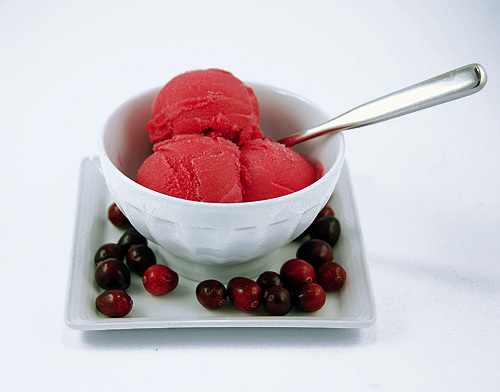 I’ve never cooked with cranberries before and I had been looking for other interesting sorbet flavors to make, so this cranberry frappe recipe really interested me. At the time it was August, so I knew I would have to wait a few months before fresh cranberries would be readily available at the store. A little over a month ago I was finally able to spot fresh cranberries at my local supermarket. 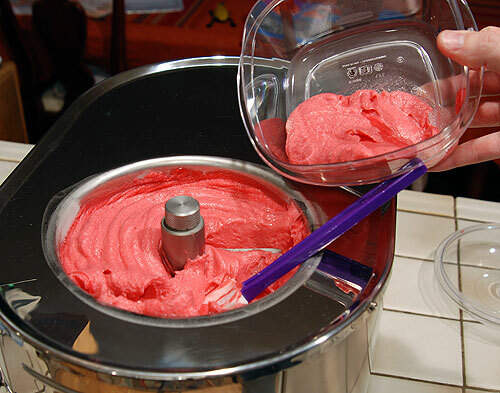 The texture of this sorbet is incredibly smooth and reminded me a lot of the raspberry sorbet I make. A frappe has more of a slushy texture, so I renamed this recipe as a sorbet since that is how I was going to serve it. If you wanted to make this into a frappe, you could under-freeze it or partially thaw and blend the mixture. 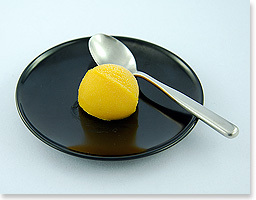 I also added limoncello to this recipe to help keep the finished sorbet soft. I did want a little orange flavoring to balance out sharpness of the cranberries, so I added some orange zest to the cooked cranberries. Although the orange zest is only with the cooked cranberries for a few minutes in the blender before being caught in the chinois, the orange flavor is still perceptible. I’ll be making this recipe again for Thanksgiving and plan to substitute Grand Marnier for the limoncello. Even if you aren’t a huge cranberry fan, this recipe will surprise you—it’s pretty good. After making this recipe I definitely think cranberries are underrated. I’m eager to try pairing them with other fruits for new sorbets. 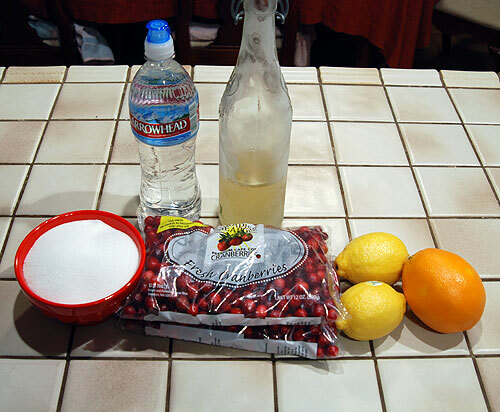 Ingredients for making Cranberry Sorbet. 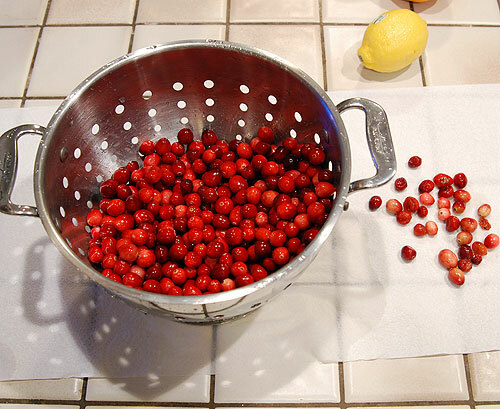 Rinse 4 cups fresh cranberries and remove any stems or oddly colored or shaped cranberries. Boil cranberries in 2 cups of water for 8 minutes. 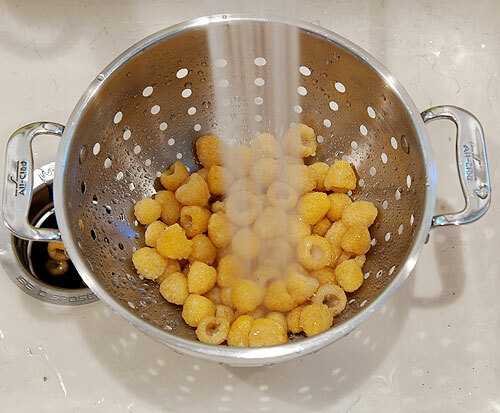 Cranberries can pop when cooked, so cover slightly to reduce splattering. 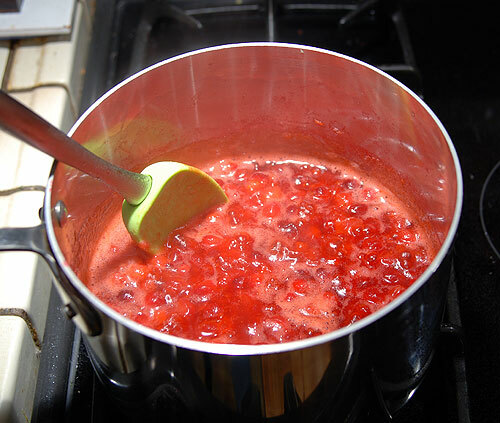 Add 2 cups of sugar and zest from one orange to the cooked cranberries (do not drain) and purée. 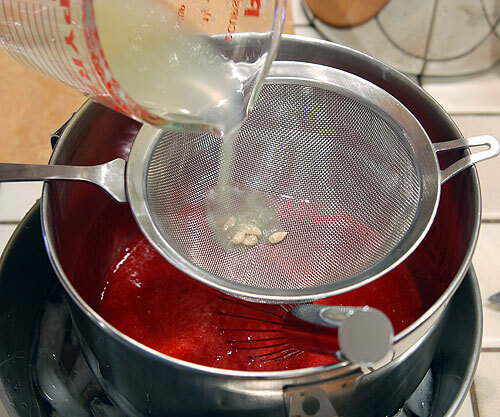 Use a chinois or sieve to separate the skins from the cranberry purée. 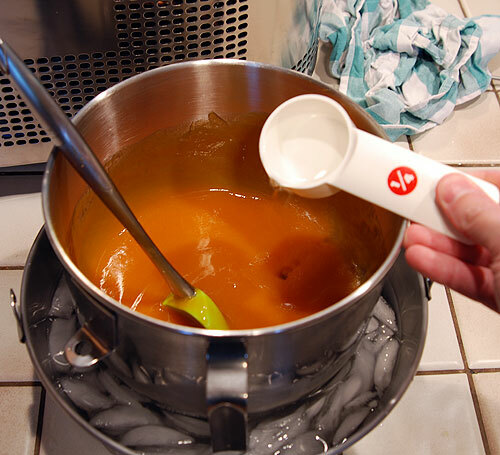 Place hot purée in ice bath and begin to chill. 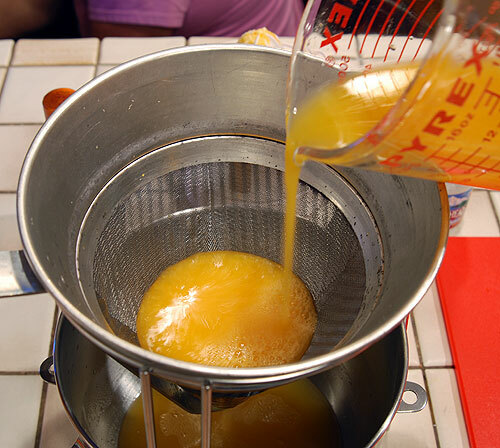 Once mixture is no longer hot, add juice from 2 lemons. 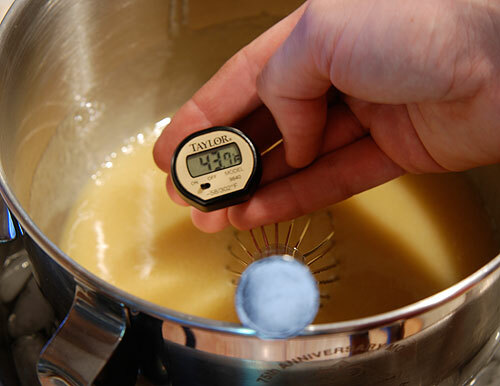 Add 1/4 cup of limoncello and continue to chill mixture until it is less than 45° F.
Pour chilled sorbet base into ice cream maker and freeze according to your maker’s instructions. 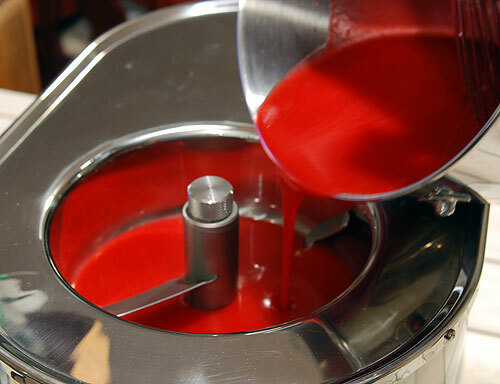 Transfer finished sorbet to dedicated container and let ripen in freezer for several hours. 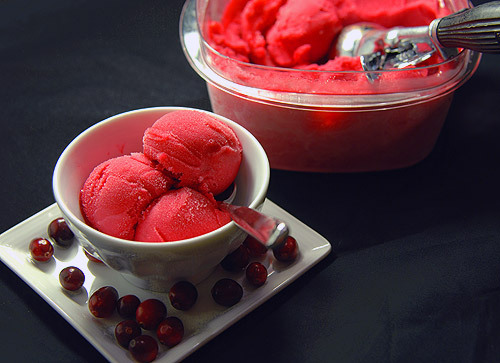 The recipe pictured above, with detailed instructions and complete photo gallery can be found on the Cranberry Sorbet recipe page. 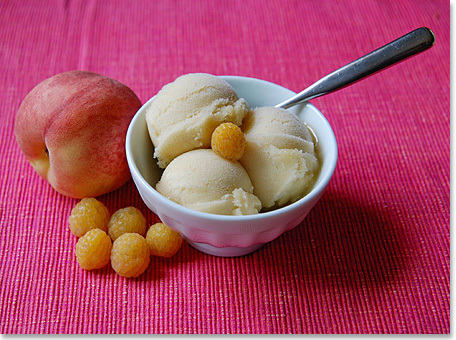 I’ve always wanted to make an apricot sorbet. Fortunately, I was able to find some dried apricots at the local farmers market last week. When I was a kid we actually had apricot trees in our yard. Actually, a lot of people had apricot trees since Silicon Valley was once full of fruit orchards. I remember empty lots between houses that contained neat rows of apricot trees. Those lots are now long gone, replaced by homes, though Apple’s Steve Jobs tore down an adjacent house in Palo Alto to put an orchard back. My grandparents also had a couple apricot trees in their yard; they would pick them and dry them nearly every year. They have since moved but still give us dried apricots every year from a nearby fruit stand. 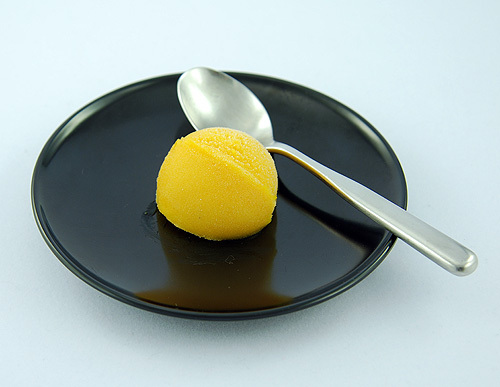 I couldn’t find too many recipes for apricot sorbet on the web, but fortunately one cookbook in my collection, Sorbets and Ice Creams, by Lou Pappas, had a recipe for dried apricot sorbet. I actually prefer dried apricot over fresh ones—the flavor is stronger and the varied texture of the dried apricots is more interesting to me. When buying apricots I always seek out the slab variety since they taste better. If you can score some Blenheim apricots, still grown in Silicon Valley, so much the better. 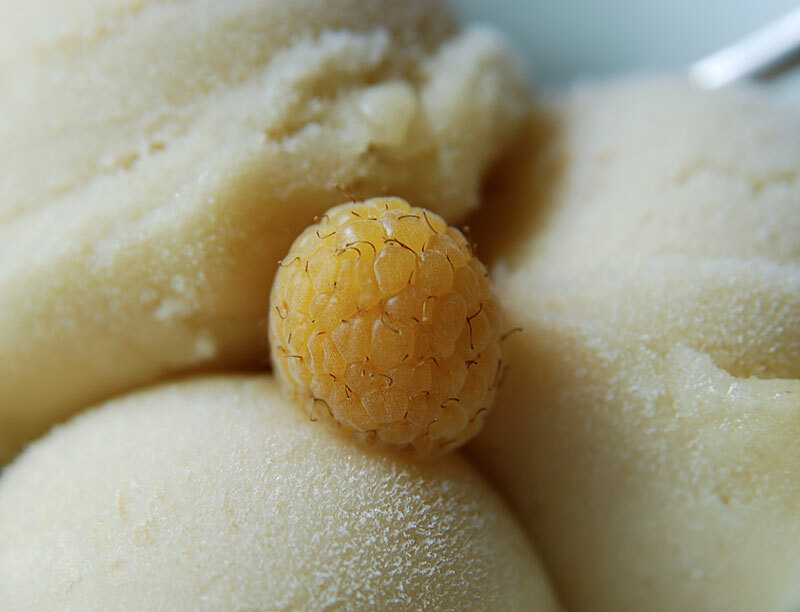 When I first made this recipe I skipped adding water since it usually just makes for an icy sorbet, but the resulting sorbet was really strong—a little too strong, actually. 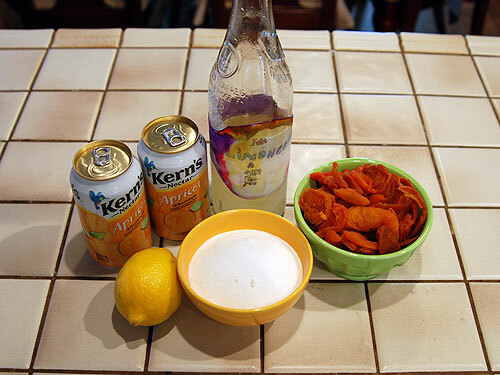 The dried apricot flavor is surprisingly powerful, so don’t be afraid to add more water (and sugar if necessary) to make it appeal to less fanatic apricot fans. 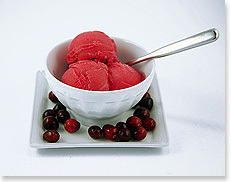 This sorbet is so smooth that you can really adjust the water level to suit your tastes without risk of iciness. A week in the freezer and this sorbet is still perfectly smooth. When serving, start with small portions since a little apricot flavor goes a long way. 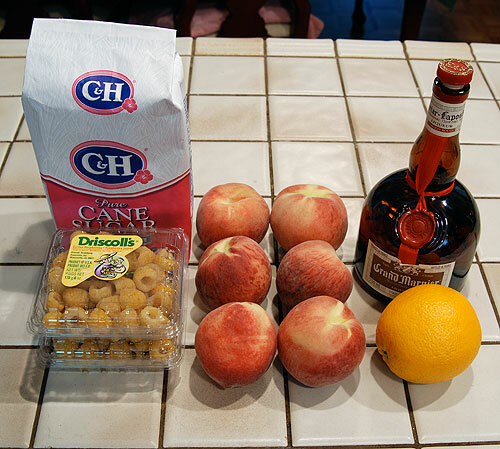 Ingredients for making Dried Apricot Sorbet. 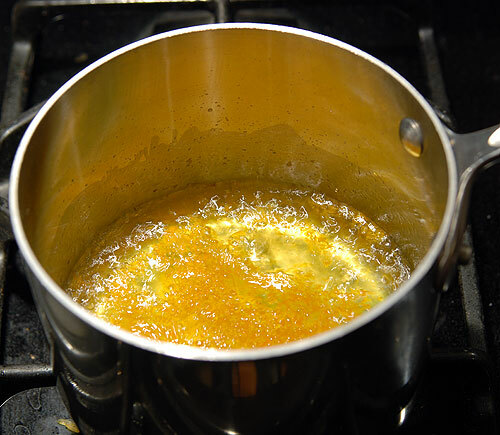 Add 2 cups of apricot nectar and 1 cup water to dried apricots in medium saucepan. 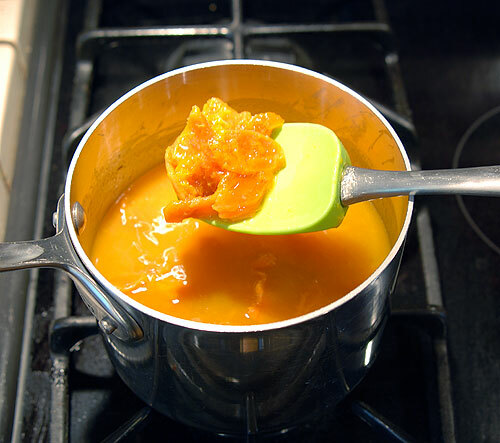 Apricots will become plump after simmering in nectar and water for 20 minutes. 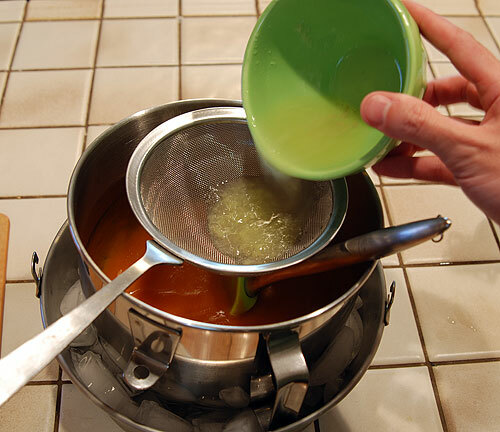 Purée apricots with 3/4 cups of sugar, keeping hand over lid during mixing to prevent hot liquid from blowing lid off. 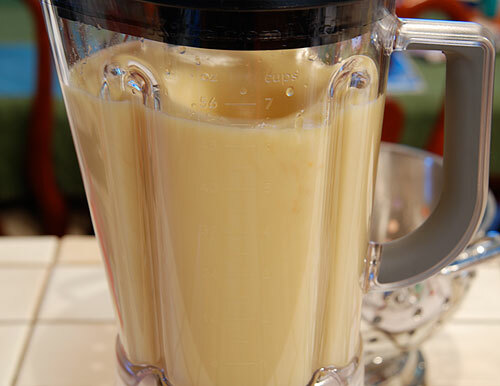 Pour 3 tablespoons of fresh lemon juice into cooled purée. 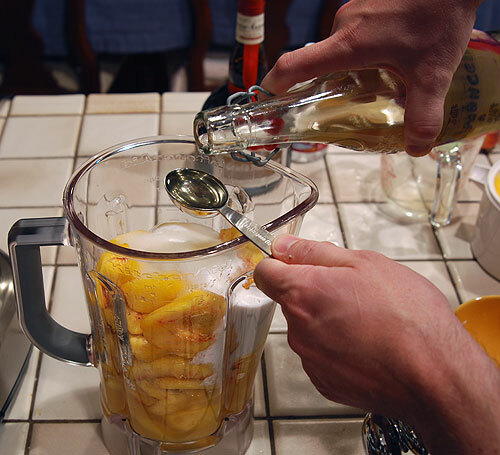 Add 1/3 cup limoncello. 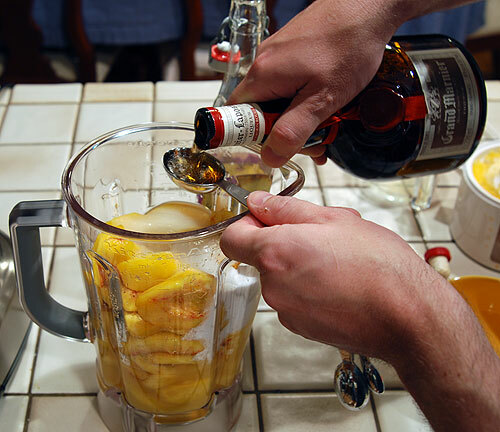 You could also use Grand Marnier. 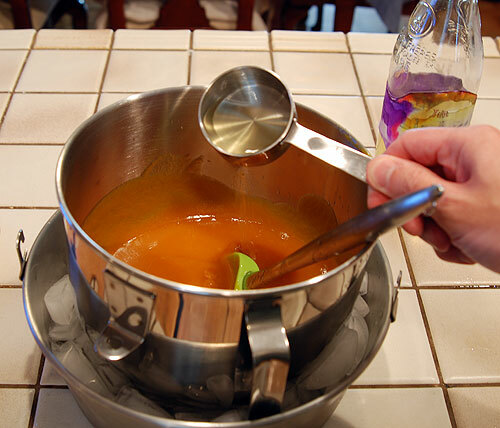 Adjust strength of apricot flavor by adding additional water as needed, 1/4 cup at a time. 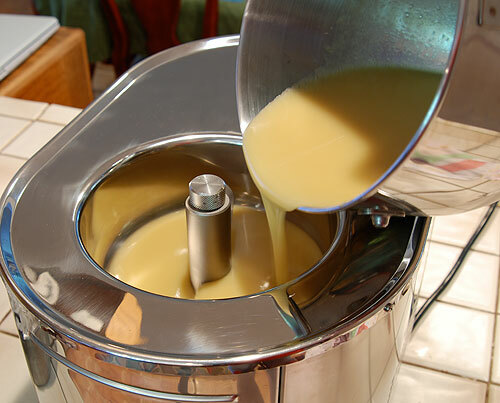 Once mixture has chilled to less than 45° F, pour into ice cream maker and freeze according to your maker’s instructions. Transfer frozen sorbet to dedicated container to ripen in freezer. 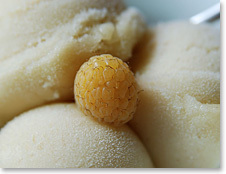 The recipe pictured above, with detailed instructions and complete photo gallery can be found on the Dried Apricot Sorbet recipe page. 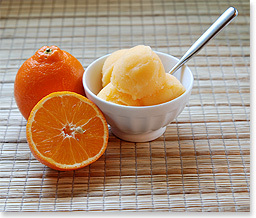 With all the sorbets that I have been making recently, my son has been requesting that I make an orange sorbet. Orange sorbet? Really? It just sounds so average, doesn’t it? Maybe if it was still just for breakfast I could make it. Maybe I could just take him to the mall for an Orange Julius and call it a day. When I was at the farmer’s market last weekend, I saw some beautiful tangelos. I wasn’t sure what tangelos were, but they looked and smelled enough like an orange that I figured I would make some for my son. What in the world is a Tangelo? Tangelos are a hybrid of a tangerine and pomelo (or grapefruit). I don’t know what a pomelo is either. Between you and me, they are very similar to oranges, but with a subtle tangerine smell and plentiful, sweet juice. 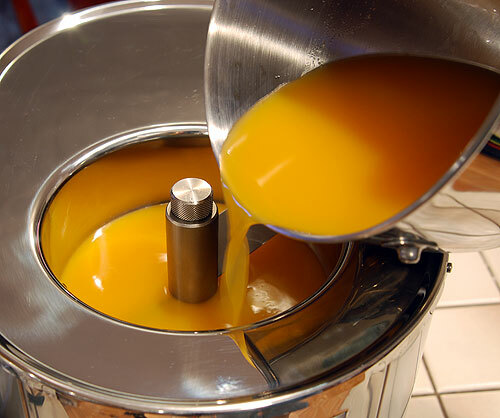 How do other people make orange sorbet? I looked around for some recipes for ideas, since I wasn’t sure if I should add water or not. 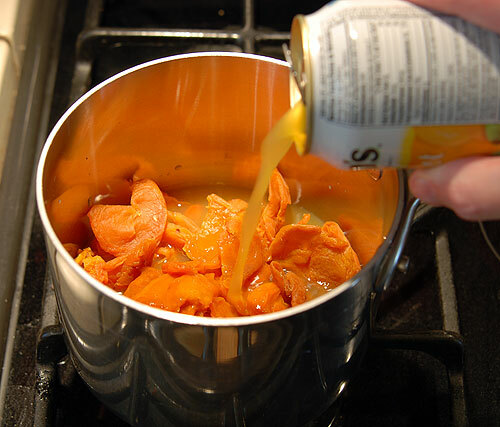 Many recipes called for boiling the zest to extract flavor and this usually meant added water unless you want to boil juice. Cafe Fernando has a great recipe for orange sorbet with no added water. 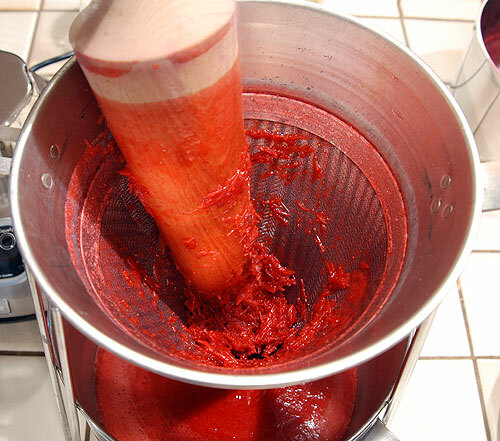 Meanwhile, Cafe Lynnylu has a great blood orange sorbet recipe with one cup of water. 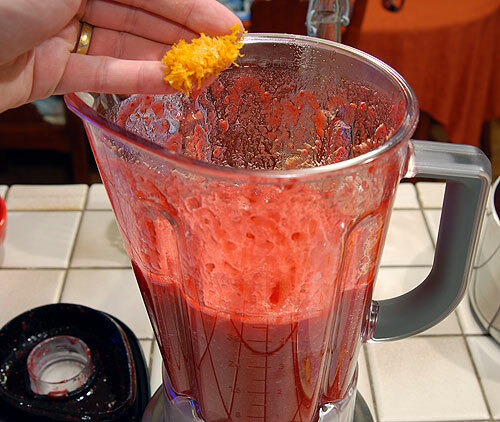 On the other end of the spectrum, Gluten-Free Girl has a blood orange sorbet recipe with 2 cups of water to one cup juice. I emailed David Lebovitz about water content in sorbets to find out if it should be added for less juicy fruits or when the flavor needs to be toned down—like lemons. David said he only adds water for lime and lemon sorbets. You can also add egg whites but he doesn’t like to go that route. 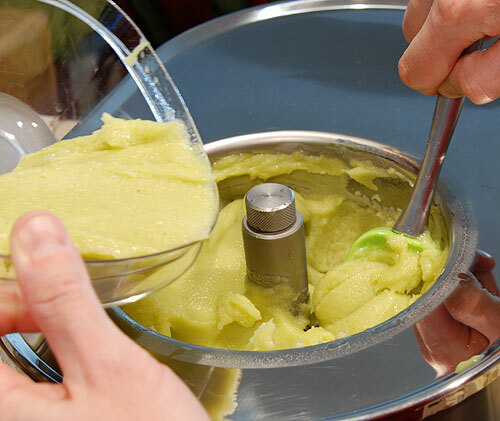 I’ve never added egg whites to sorbet, but I see it in many sorbet recipes, and that is probably how Gluten-Free Girl can have so much water in the sorbet and maintain a good texture. 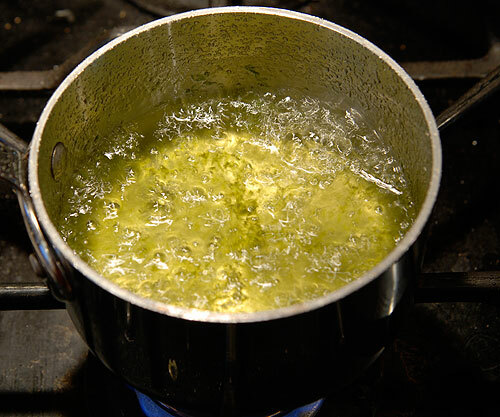 I decided to skip the egg whites and I didn’t want to boil juice, so I ended up boiling just enough water to dissolve the sugar and extract flavor from the zest. 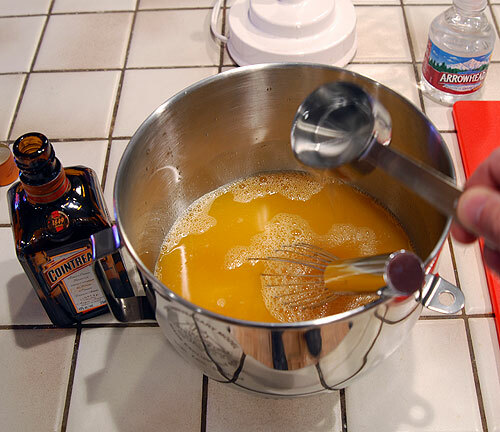 I also thought I would add Cointreau instead of Grand Marnier since it has a stronger orange flavor. Would my son like it? My son can be pretty picky, and I debated even telling him the tangelos I bought were oranges, but he seemed ok with the fact that they weren’t really oranges. 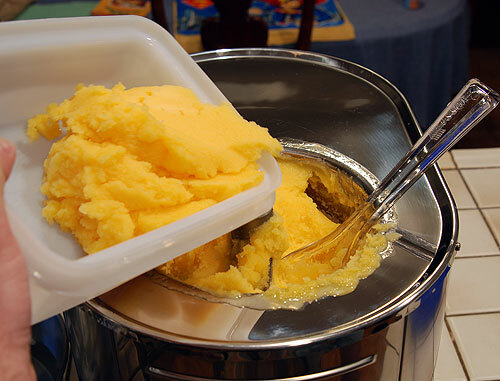 The subtly distinctive flavor of tangelos combined with Cointreau yielded this delicious sorbet recipe that everyone—my son included—enjoyed. 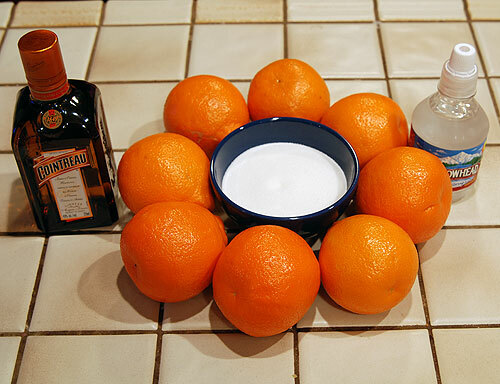 Ingredients for making Tangelo Sorbet. 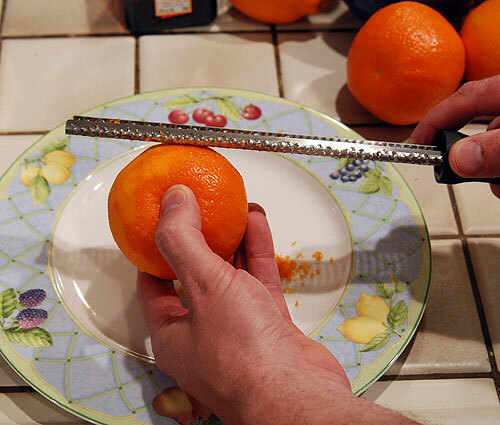 Use a microplane grater to remove the zest from one tangelo. Gently boil sugar, water and tangelo zest for 5 minutes. Juice enough tangelos until you have about 4 cups of juice. 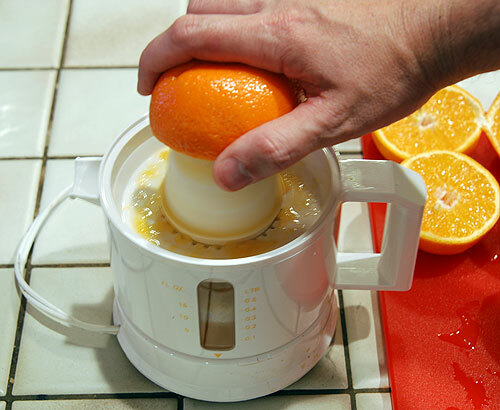 Pour tangelo juice through chinois or strainer to remove pulp and seeds. 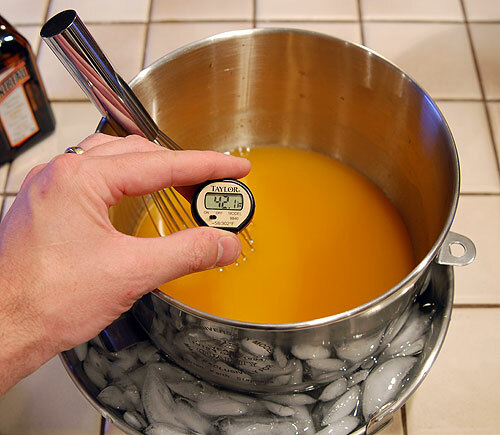 Add 1/4 cup of Cointreau (optional). 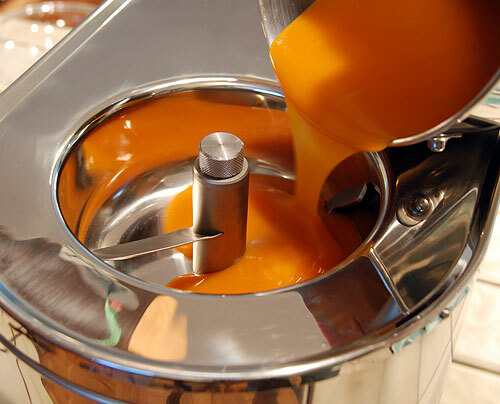 Pour chilled mixture into ice cream maker and freeze according to maker’s instructions. 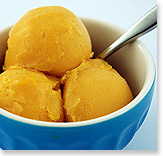 Once sorbet has finished freezing, transfer to dedicated container and let ripen in freezer for several hours. 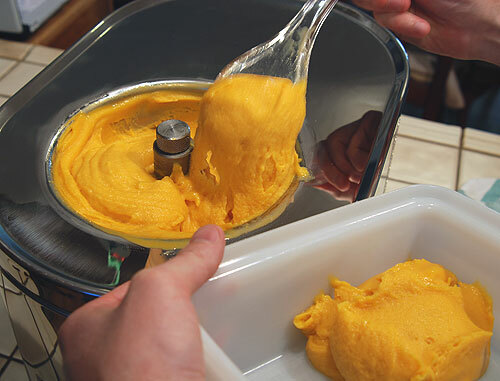 The recipe pictured above, with detailed instructions and complete photo gallery can be found on the Tangelo Sorbet recipe page. 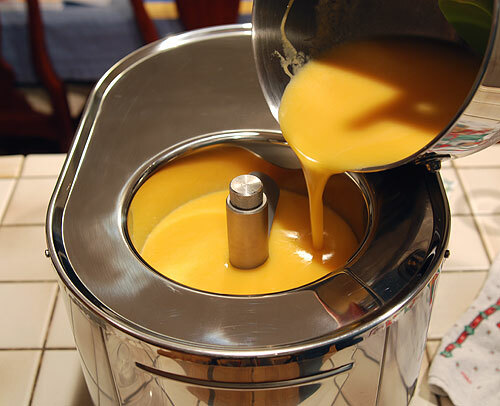 In the last few weeks, I’ve had a desire to make a new sorbet recipe. Every visit to the store I would check out the produce section, looking for some fruit that I hadn’t made a sorbet with before. At some point I want to try out a kiwi or melon sorbet, but I have been in the mood for something a little less subtle lately. I’ve also been tempted to cruise the local fruit stand, where I can always find fruits and berries never seen at the supermarket. As fate would have it, a coworker at my new job would intervene with several bags of peaches from her yard. Peaches in hand, I went in looking for a recipe for peach sorbet. I was surprised to discover that there weren’t any peach sorbet recipes in my library of cookbooks, so I went online for some ideas. It turns out that the internet wasn’t too great a resource either, though I did find a good recipe at Pinch My Salt. Most of the other recipes I found contained additional water and also called for brandy, amaretto or marsala liqueurs. Having made peach ice cream a decade ago with almond extract (should have used amaretto! 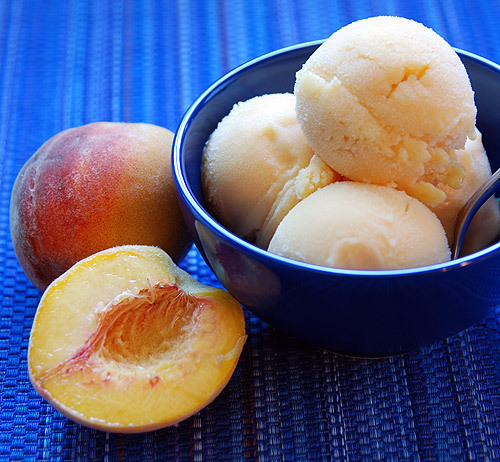 ), I can attest to the successful pairing of peaches with these kinds of flavors, but I wanted a recipe for peach sorbet that was light and fresh. With a few ideas, I set out to create my own recipe. Many peach sorbets called for either orange or lemon juice, so I opted for both. I hoped that the orange juice would broaden the delicate peach flavor a little while the lemon juice would add to the freshness factor. I originally planned to add a cup of water to the sorbet, as seen in the ingredients photo below, but later decided against it. 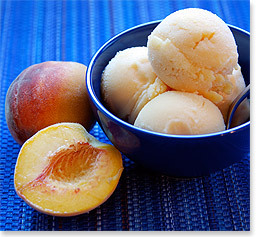 I can understand adding water for lemon sorbet, but peaches have such a delicate flavor it seemed silly to dilute them. This just left me with a liqueur to choose. I’ve made sorbets with and without liqueur, and I swear by the extra complexity and, more importantly, the softer texture that alcohol lends to a sorbet. I was reluctant to just go with just limoncello since I was afraid it the lemon flavor would outshine the peach. In the end I decided to go with a mix of Grand Marnier and limoncello. To my astonishment, I actually accomplished what I set out to do! 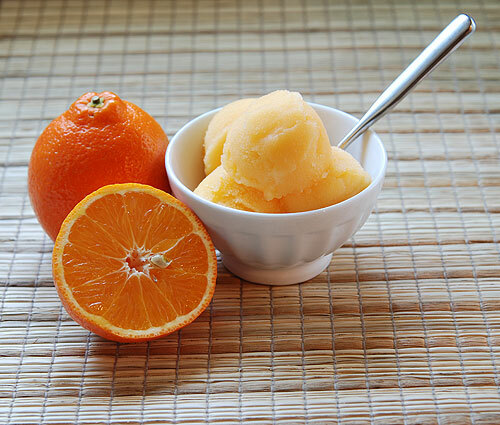 This sorbet is bright and refreshing—perfect for a hot summer’s day. Like a lot of sorbets, this peach sorbet recipe is no-cook, so you can whip it up in no time and be eating it for dessert. 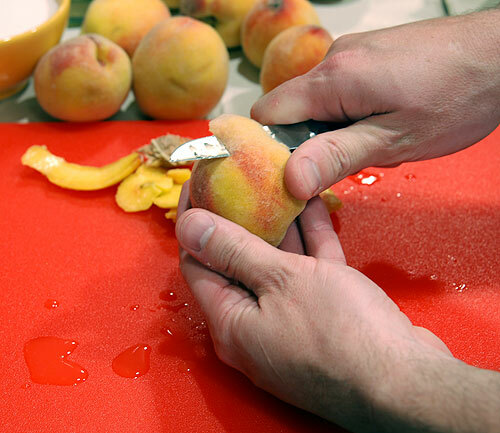 The peaches I used are pretty small, so if you use larger peaches you can reduce the number to about nine or ten. The goal is to get about 4 cups of loosely packed, sliced peaches—and I’m not talking about canned! 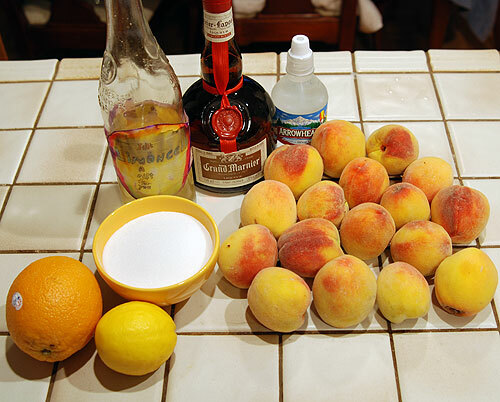 Ingredients for making Peach Sorbet. 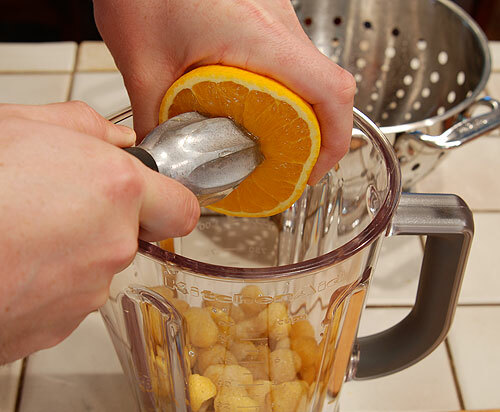 Pour the juice from one orange and one lemon into blender. 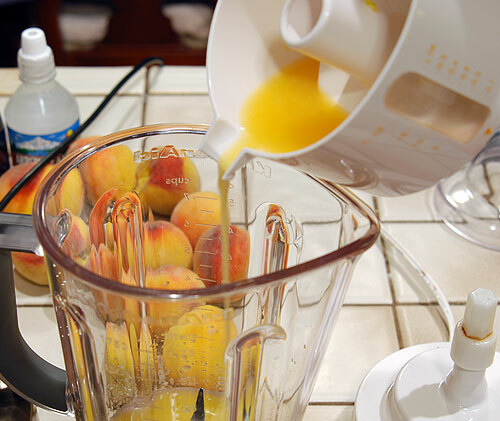 Peel and pit around 16 small peaches and add to the juice the in blender. 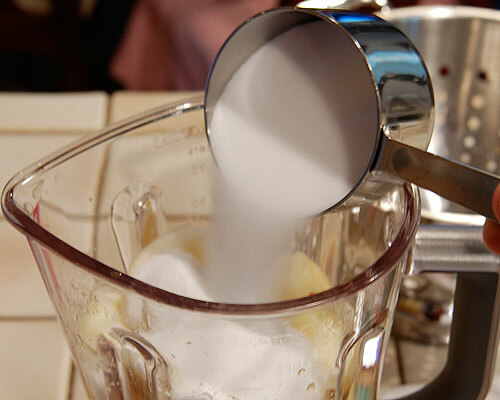 Pour 1 1/3 cups of sugar into blender. 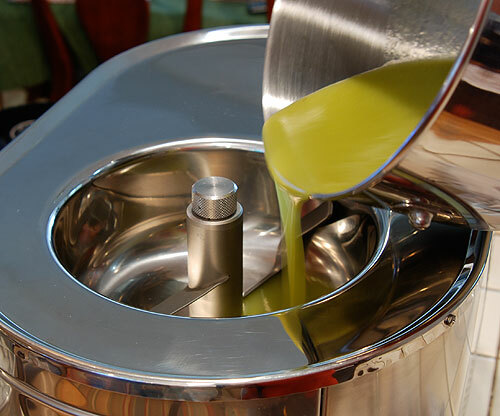 Add 2 tablespoons of limoncello. 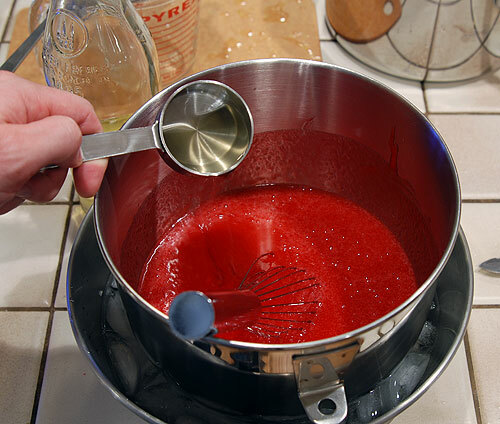 Add 3 tablespoons of Grand Marnier. 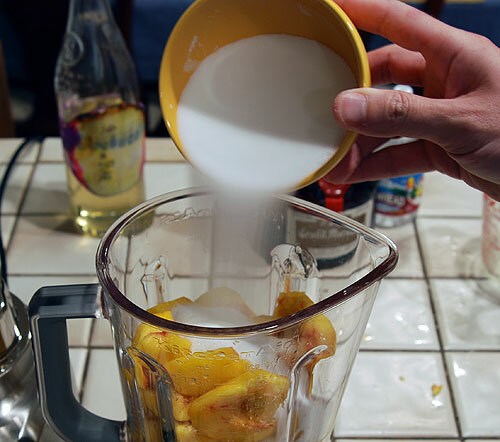 Purée peach mixture until smooth, about 1 minute. 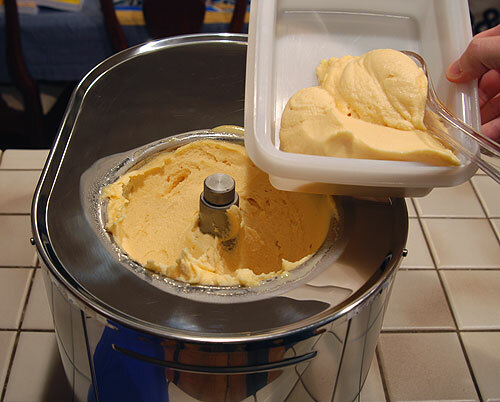 After chilling mixture to less than 45° F, freeze according to your ice cream maker’s instructions. 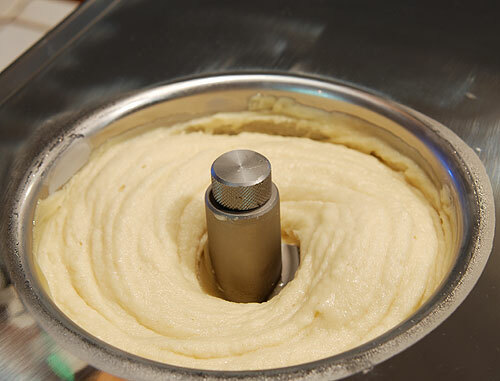 The recipe pictured above, with detailed instructions and complete photo gallery can be found on the Peach Sorbet recipe page.